Abu Dhabi Ocean Racing this morning closed out fifth place on Leg 6 from Itajaí, Brazil to the USA, arriving under a moonlit sky just before dawn in Miami, Florida. 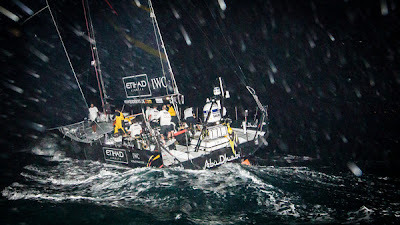 Abu Dhabi crossed the Leg 6 finish line at 08:57:37 UTC on Thursday after 17 days, 15 hours and 57 minutes and 37 seconds of racing. Skipper Ian Walker said a general lack of speed had led to the fifth place result, seven hours and 51 minutes behind fourth placed Team Telefónica. Yesterday afternoon, American skipper Ken Read brought PUMA Ocean Racing powered by BERG into Miami in first place -- their second consecutive leg win of the race -- ahead of second placed CAMPER with Emirates Team New Zealand, skippered by Chris Nicholson. Franck Cammas’ Groupama sailing team took third, after edging overall race leaders Team Telefónica, skippered by Iker Martínez, into fourth. Walker said the Abu Dhabi crew were disappointed to be last into Miami after previously losing out to Groupama sailing team in a nip and tuck battle for fourth on the approach to the Turks and Caicos Islands. Walker admitted that a lack of raw boat speed had made it difficult for Abu Dhabi to be competitive, but said the whole crew had never let their heads drop at any point during the leg. “This is not what any one of us is here for, but we know how tough this fleet is and we just don’t seem to have the legs at the moment to hang with the other boats and that’s making life very difficult for us,’’ Walker said. Walker said being unable to keep up with the other boats had put continual pressure on navigator Jules Salter and himself to find ways to get the team back in contention. “It’s just been a tale of bleeding miles,’’ he said. “The fleet spent a lot of time in similar wind, sailing the trade winds, sailing a very similar strategy and for whatever reason we weren’t sailing as fast as the other boats. “Day in, day out, those miles add up. It puts a lot of pressure on Jules and myself to try and pull a rabbit out of a hat and find something extra and make up for that. Walker said the need for speed had forced the crew to take two risks: packing a minimal amount of food in a bid to save weight -- which resulted in some very hungry crewmen; and making some ‘roll-the-dice’ moves in the Caribbean. “As the leg went on we took more and more risk to try and get a bit of leverage to try and get back to Groupama,” Walker said. “That didn’t work out for us in the end. “The only other option was to just follow in their wake and just lose more miles, so that makes it a very difficult place for us. “I think anybody following the race would see we have a speed issue and it’s an issue that we see pretty much on all points of sail, some more than others. It’s not to say we didn’t make any mistakes, but I’m sure all the boats out there made mistakes at some point during the leg." Abu Dhabi score 10 points for fifth place, taking their overall tally to 68. The Leg 6 results have thrown the leaderboard wide open and left the top four teams within 17 points of leaders Team Telefónica. With three more offshore legs and four more in-port races to be sailed before the race finishes in Galway in Ireland this July, the top four all still have a credible chance of lifting the overall trophy.